Resurrecting The Unicorn - Bud Harris, Ph.D. Massimilla Harris Ph.D.Bud Harris, Ph.D. Massimilla Harris Ph.D. In the present day, our culture’s evolving masculine spirit seems to be sputtering out. We began with a powerful, creative force, yet somewhere along our path, phallus has been rendered impotent. 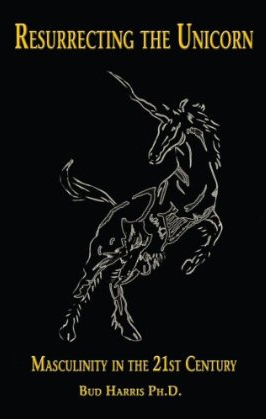 The unicorn, this wondrous masculine symbol, has been reduced to a limp-horned stuffed animal found in novelty stores or worse yet, discarded to a dusty old shelf of a second-hand thrift shop. Resurrecting the Unicorn addresses the impoverished state of masculinity in the 21st century. Without a strong masculine image, our souls become fragmented and we lose our way. In fact, this is how many men feel today and women, too as we all have these inner components. When we are in such a state of psychological confusion and imbalance, we must begin again to search for The Holy Grail; The Grail is the symbolic container of the psycho-spiritual contents that can nourish, balance, and renew our lives. All the compensatory posturing, chest-pounding or drum-beating in the world won t revive this great masculine spirit! This can only be accomplished by developing a deeper relationship to soul. The mental landscape of metaphors dreams, stories, myths, fairy tales deal with the eternal truths of human nature and are the language of soul. In Resurrecting the Unicorn, Bud Harris guides us deep into the realm of metaphors so we can examine the evolution and development of human consciousness and reclaim discarded, yet much needed, aspects of our humanity.